$349 Seen a lower price? 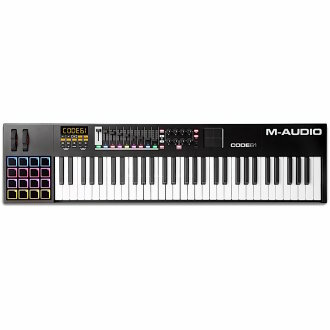 The M-Audio Code 61 is a premium, versatile keyboard controller. It has a velocity- and aftertouch-sensitive keybed; 8 assignable faders, knobs, and button controls; an X/Y control pad; transport controls, and it's responsive to HUI, Mackie and ASCII commands. The Code 61 ships with a suite of full-version virtual instruments, too. The Code Series offers several thoughtful design touches that enable you to really perform your best. Your keyboard shouldn't be an obstacle standing in the way of your creativity. Instead, it should function as a direct extension of your thoughts and ensure that you can convey your musical ideas with immediacy, precision and clarity. The Code 61 has a keybed with action that is smooth, precise and inspires confidence. You'll fly over the keys, unlike many other keyboards that seem like they're fighting you every step of the way. This is a remarkable instrument that feels familiar and comfortable right away -- you'll be translating your ideas into killer tracks in no time! When your inspiration is in high gear, your keyboard has to be in lockstep with you. That's why the Code 61 is equipped with everything you need to produce some serious musical creations. There is an X-Y Touchpad that allows additional support over effects and instrument plugin parameters across an X/Y axis, instead of using a large number of knobs and fader controls to do the same thing. The X-Y Touchpad is faster, easier to use, and far more intuitive. It also doubles as your touchpad mouse for your Computer. Every DAW uses keyboard shortcuts to execute common functions (like adding tracks, cut/paste, etc.). The pain is jumping back and forth between your computer and your keyboard to perform these functions. It's disruptive and it wrecks your creative flow. There are 16 RGB backlit pads to indicate at a quick glance exactly what function any particular pad is assigned to. The buttons, knobs and faders are also color-coded to indicate what mode they're in. It all adds up to no confusion, no guessing. No more activating the wrong control at the wrong time because you didn't know what it was doing. The 6-digit LCD screen provides informative feedback, including on-screen display of parameters and settings. The Code 61 supports the Mackie Control/HUI modes for working with DAWs. The Mackie HUI mapping protocol was created jointly by Mackie and Digidesign in 1997 for the "Mackie HUI" (first hardware control surface for Pro Tools). Since then, this protocol has been adopted by almost all major DAW platforms for a variety of hardware controllers from other manufacturers. It's become a standard across DAWs for MIDI controllers for mapping knobs, faders, buttons, and transport control. The Code 61 fully support this protocol. Available until 11 PM (EST) today. Mention special code 208-TTCG when you call.